Abstract: In her October column, Kerry discusses art exhibitions that concern Michael Jackson. Artists from around the world are inspired by Michael Jackson and the National Portrait Gallery will exhibit numerous artists next summer. Hennigan, Kerry. 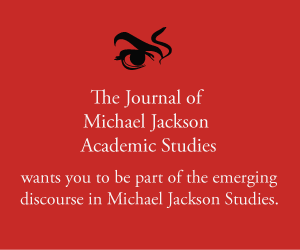 “MJ Studies Today XXII (14-10-2017).” The Journal of Michael Jackson Academic Studies 5, no. 1 (2017). http://michaeljacksonstudies.org/mj-studies-today-xxii/. This is an exciting development. The inclusion of images like LaChapelle’s Michael Jackson trilogy and others featured in exhibitions in the years since Michael’s passing have already sown the seeds for increased recognition and appreciation of Michael’s impact on popular culture as explored by a variety of artists working in various media. Now, the high profile “Michael Jackson: On the Wall” exhibition will focus considerably more attention on him as a subject worthy of serious artistic consideration and interpretation. There will also be an accompanying scholarly publication featuring essays by Dr Nicholas Cullinan, Margo Jefferson and Zadie Smith. “All the artists included – despite coming from different generations and parts of the world, and employing a range of media – are fascinated by what Jackson represented and what he invented. It is rare that there is something new to say about someone so famous, but here that is the case,” said Dr Cullinan, who is the Director of the NPG. “Michael Jackson: On the Wall” could prove to be the greatest shown in London, with fans and art aficionados travelling from far and wide to view it. I hope to be one of them, and I certainly don’t expect to be alone. As photographed by the author at the LaChapelle exhibition at the Art Gallery of Ballarat, September 2017. “Sowing seeds” photographed and edited by Kerry Hennigan, September 2017.